Barbara Weisz hopes Mayor Denis Coderre’s compassion extends to handicapped drivers. Coderre expressed delight in October when Canada Post announced a delay in its plans to change from door-to-door service to community mailboxes. “If you have mobility problems or health problems, are you going to, say, walk in minus-20C” to get your mail, Coderre said at the time. Weisz, 63, who suffers from debilitating arthritis in her hands, hopes that thinking will extend to drivers like herself who hold a disabled parking permit. Montreal provides parking spots for disabled drivers, but she says there are not enough, as she finds they are usually taken. In 2010, MEMO-Qc, an organization that advocates for handicapped people, estimated that handicapped parking permit holders represented 1.72 per cent of the population, but reserved parking spaces for the handicapped accounted for less than 0.92 per cent. Weisz says that, in winter, parking can be a nightmare for a person with reduced mobility. “When I was trying to pay for parking in front of a medical building in Côte-des-Neiges, I had to cross the street and walk uphill to put money in the meter. Half the time I just take a chance. It’s too difficult for someone who has problems walking when it’s too icy or too cold.” People with canes and walkers also have great difficulties stepping over snow banks in order to reach the pay station, she says. Though an app exists that allows drivers to pay for parking via smartphone, Weisz says this does not work for everyone. The majority of handicapped parking permit holders are seniors, she says, and many of them do not own cellphones. Edmonton, Toronto and Ottawa, the same can be done in Montreal. Last year, Stationnement de Montréal, the organization responsible for managing parking meters in the city, collected $62.9M in on-street parking revenue. 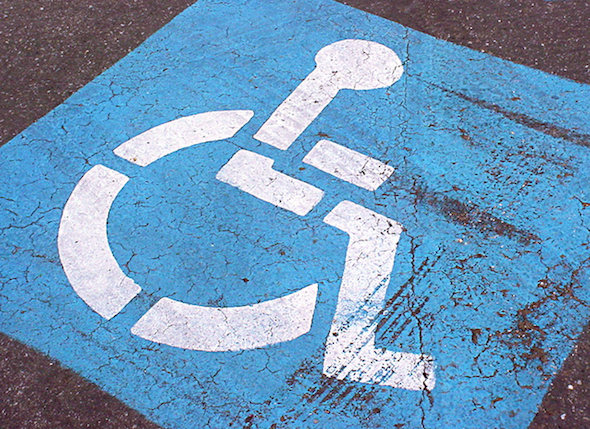 In 2008, Weisz took the issue to a Montreal council meeting, where then-mayor Gerald Tremblay said he was “seriously considering” providing free handicapped parking. Michael Watkins, of the Office des personnes handicapées du Québec, agrees that more handicapped parking spaces are needed but says free parking is not the answer. “The basic principle of social integration is giving persons with disabilities the proper measures to bring them to the same level as others,” he said. “But the person with a disability has a spot reserved closer to the building. Be the first to comment on "Driver calls for free parking for the handicapped"